Alysa Stanton poses in front of an ark in the synagogue at Hebrew Union College, Thursday, May 21, 2009, in Cincinnati. 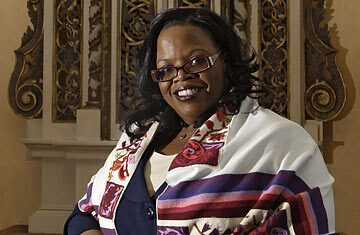 Stanton is to be ordained June 6, as mainstream Judaism's first black woman rabbi. She will become the rabbi at Congregation Bayt Shalom in Greenville, N.C., on Aug. 1. The path to the pulpit has been as colorful as it has been unusual for Alysa Stanton, 45, America's first-ever female African-American rabbi. Stanton, who was born to a Christian family, was formally ordained on June 6, having completed seven years of rabbinical training at Hebrew Union CollegeJewish Institute of Religion in Cincinnati. Stanton will now assume her new role as the first nonwhite rabbi of Congregation Bayt Shalom, a 60-family synagogue in Greenville, N.C.
Two decades ago, an African-American leader in a synagogue might have been about as likely as an African American in the White House. But Stanton's ascendancy reflects the slowly changing face of America's Jews. According to Diane Tobin, a demographer with the San Francisco-based Institute for Jewish and Community Research (IJCR), some 20% of American Jewry is now non-Caucasian. While there is no data specifically on black Jews, "a large percentage [of nonwhite Jews] are African American," Tobin says. "Most arrive via conversion, adoption or mixed Jewish-black marriages," she adds, "and are far from Judaism's fringes and part of traditional communities." That would fairly describe Rabbi Stanton's journey. Her childhood in Ohio was a conventional one, but, as a self-described "old soul," Stanton says she was propelled early on by a search for spiritual nourishment, which led her far beyond her Pentecostal roots. She was attracted initially to Eastern religions and Evangelicalism, until her family moved to a predominantly Jewish suburb of Cleveland. Curious about the mezuzahs in the doorways of neighboring homes  along with other unfamiliar Jewish customs  Stanton turned for guidance to a Catholic uncle who occasionally worshipped at a local temple. But Stanton's outsider status did nothing to keep her from becoming the ultimate Jewish insider, an officially ordained rabbi. She beat out some half-dozen candidates for the position of rabbi at Congregation Bayt Shalom in North Carolina. Much of Stanton's appeal, says synagogue president Michael Barondes, lies in her ability to connect and communicate powerfully, both from the pulpit and face-to-face. Those are skills Stanton honed during an earlier career, before entering the seminary  as a psychotherapist specializing in grief and loss. She helped counsel victims of the 1999 shooting at Columbine High School. "She knows intuitively how to listen to people," says Barondes. "And as a one-synagogue town, we need a rabbi who can reach out to all of our members." Barondes says Stanton's color played no role in her candidacy, but neither he nor Stanton  a divorced single mother to Shana, 14  is unaccustomed to the impact of race in America, particularly in the South. Indeed, leaders of the Alabama synagogue where Stanton trained for a year as a student rabbi never believed their white congregation would accept an African-American at the pulpit. Complaints were lodged and calls were made. Yet by the end of her training, the synagogue was deeply saddened to see her go. "Everyone has their initial impressions and outmoded stereotypes," Stanton reflects on the experience. "But these people came to embrace me and my child." Thanks to other high-profile rabbis, such as Capers Funnye, the African-American leader of Chicago's Beth Shalom B'Nei Zaken synagogue  and First Lady Michelle Obama's second cousin  mainstream American Jewry appears ready to embrace leaders like Stanton. And with African Americans becoming increasingly drawn to Judaism, in part because of the shrinking perception that they are not welcomed by white Jews, the IJCR's Tobin say the timing could not be better for American Jewry to finally reconsider who and what makes a Jew. "Due to assimilation and intermarriage, the stability of the American Jewish community has never been more vulnerable," she says. "If we are to survive we must become more welcoming to people and not just send them away."